Remove front door finisher. 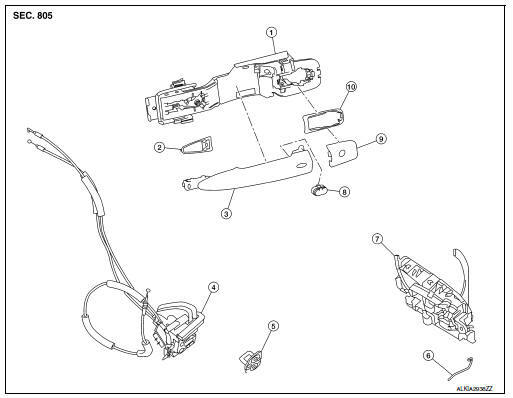 Refer to INT-15, "Removal and Installation". 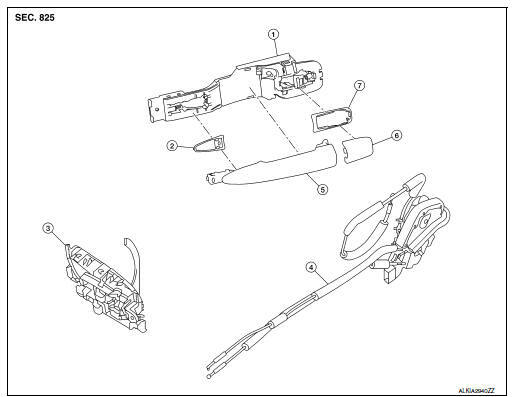 Remove screws (A) and inside handle assembly (1). 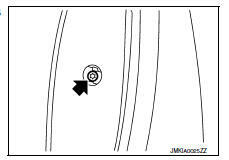 Check front door lock cables are properly engaged to inside handle. Fully close front door glass. Remove front door vapor barrier. Remove front door glass channel rear. 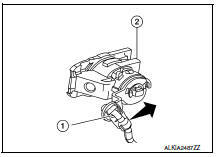 Disconnect the harness connectors from the door antenna and door request switch and then remove harness clamp on outside handle bracket.
) that retains the front door outside handle bracket. 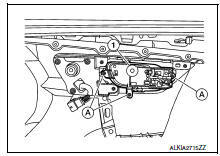 Reach in to separate door key cylinder rod (LH side) (1) from door key cylinder assembly (LH side) (2). 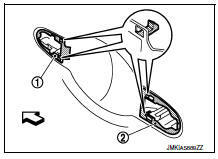 While pulling (1) outside handle, remove (2) door key cylinder assembly (LH side) or outside handle escutcheon (RH side). 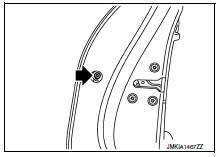 While pulling outside handle (1), slide toward rear of vehicle to remove outside handle. 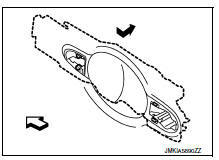 Remove front gasket (1) and rear gasket (2). 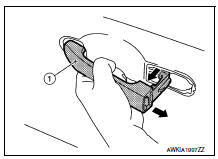 Slide outside handle bracket toward rear of vehicle to remove. Disconnect the outside handle cable from the outside handle bracket connection. When installing door key cylinder rod on the (LH) front door, be sure to rotate door key cylinder rod holder until a click is felt. Check front door lock cable is properly engaged to outside handle bracket. Remove rear door finisher. Refer to INT-19, "Removal and Installation". 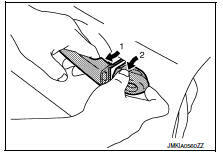 Remove screws (A) and inside handle (1). 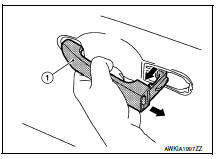 Check rear door lock cables are properly engaged to inside handle. Fully close rear door glass. Remove rear door vapor barrier. the rear door outside handle bracket. 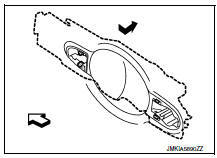 While pulling (1) outside handle, remove (2) outside handle escutcheon. Remove clip and disconnect the outside handle cable from the outside handle bracket. Installation in the reverse order of removal. Check rear door lock cable is properly engaged to outside handle bracket. Remove screws and the front door lock assembly. 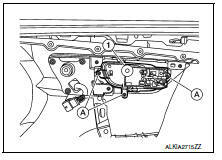 Remove the screws and the rear door lock assembly.